Sampson State Park, located in Romulus, New York, just south of Geneva, slopes gently above the eastern shore of Seneca Lake. A million years ago, a river flowed where the lake is today. During the Ice Age, great continental glaciers bulldozed their way from Canada. 12,000 years ago, the melting glacier left behind a deep basin in the ancient river valley, creating a lake over 600 feet deep. After the Ice Age, primitive nomadic hunters arrived. In the 1600's, Europeans encountered Seneca Indians who led a settled agricultural existence. The Senecas are one of the Six Nations of the Iroquois Confederacy. During the Revolutionary War, Iroquois towns were destroyed by the Continental Army. A state historical marker along the highway south of the park entrance notes the burning of the Seneca town of Ken-dai-a. Much of the land between Seneca and Cayuga Lakes was awarded to soldiers as payment for their service. Farmers then moved onto the land that is now the state park. A century and a half later, with the outbreak of World War II, quiet farm life made way for the second largest naval training station in the country, named for Rear Admiral William T. Sampson from Palmyra, NY. After the war, Sampson State College educated returning servicemen. Sampson was used as an Air Force Base during the Korean War, and in 1960, became a state park. 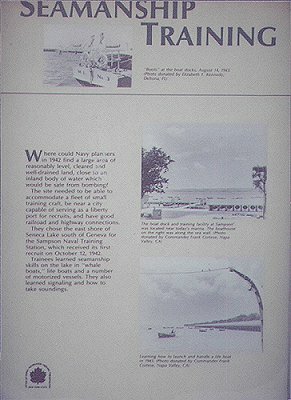 In 1995, the Sampson Naval Veterans Museum opened in the park. A Sampson Air Force veterans museum is under construction. The military buildings and roads have been removed or adapted over the years in the transformation to the state park. Old drill fields and other cleared land are slowly growing up in grasses, wildflowers, shrubs and scattered trees. Eventually a mature forest will emerge. Several wooded ravines cross the park. Willow and poplar trees have taken over the long, wild shoreline. This changing landscape makes excellent habitat for birds, deer, raccoons, foxes, rabbits, opossums and other animals. Ducks and other waterfowl live on the lake, which is famous for its trout fishing. Look for educational signs throughout the park that tell the story of nature and people at Sampson. Camper recreation program July andAugust. Permitted activities are posted in the park office. After Labor Day Weekends Only Until Oct 8. The Access Pass is available to New Yorkers with qualifying disabilities. The Golden Park Program allows Senior citizens who are New York State residents and 62 years of age or older unlimited weekday and non-holiday access to all state parks by showing a NYS driver's license or non-driver identification. A very relaxing get-away is Sampson State Park. This picturesque park boasts spacious campsites, and clean facilities. With it own marina, bring your watercraft for fun on Seneca Lake. Tour the museum for WWII memories. Besides all its beauty, this park has special meaning for me. My Father was trained here in 1944 when Sampson was a navel training base. There are so many pictures of servicemen that trained here, that I have yet to find my Dad's picture! Sampson is such a lovely park that we have reservations to return this year. Information, other than Persnal Review, quoted from the NY State Office of Parks, Recreation, and Historic Preservation brochure.